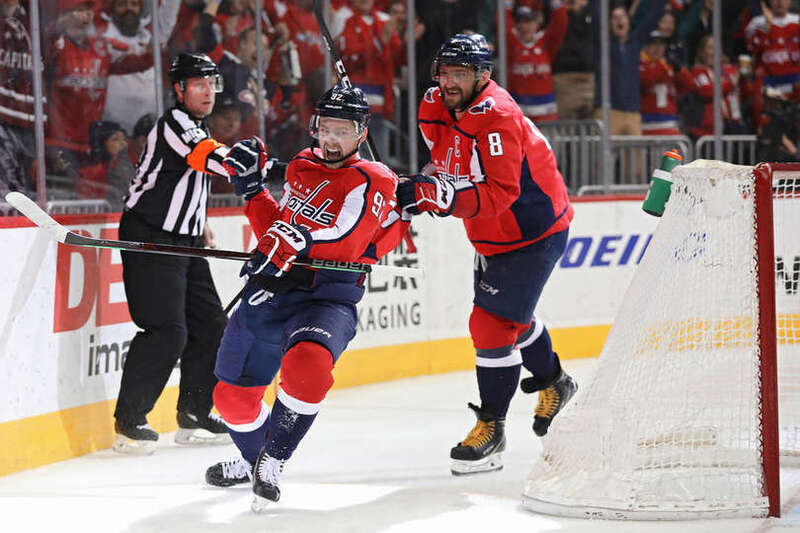 The Washington Capitals wraped-up their season-long six-game homestand (longest homestand in 13 years) with a 6-4 win over the Los Angeles Kings at Capital One Arena Monday night. The Capitals finish the homestand with a 4-1-1 record. The win also improves the Capitals record to 31-18-7, (69 points) on the season. The Capitals now embark on a six-game road trip, starting with a stop in Columbus to face the Blue Jackets tomorrow night. Puck drop is set for 7:00 PM. The Capitals would open the scoring with a power play goal from Alex Ovechkin, but the Kings would answer right back. Brett Connolly would give the Capitals the lead again, but the Kings would tie things up with a power play goal of their own for a 2-2 game at the first break. The Kings would retake the lead early in the middle frame, but the Capitals would answer with goals from Kuznetsov, Djoos and Vrana for a 5-3 lead at the second intermission. The Kings would close the gap to one midway through the final frame, but Evgeny Kuznetsov would answer with his second of the game to make it 6-4, the final. Scratches: Madison Bowey and Dmitrij Jaskin were the healthy scratches. The Capitals opened the scoring with a power play goal from Alex Ovechkin at 3:07 of the first period. The goal was Ovechkin’s 38th of the season. Evgeny Kuznetsov (37) and T.J. Oshie (16) were credited with the assists. But the Kings would answer back. Austin Wagner would receive a between-the-legs pass from Derek Forbot for the score at 4:50 of the opening period. The Capitals would regain the lead late in the opening stanza with a dirty goal from Brett Connolly at 15:17 of the period. Andre Burakovsky (9) and Matt Niskanen (14) were credited with the helpers. But once again, the Kings would answer right back. This time Tyler Toffoli would pot a power play goal at 17:22, tying the game at 2-2. The first stanza would conclude with the game tied 2-2. The Kings out-attempted the Caps 14-11. The Kings were 1 for 3 and the Capitals 1 for 2 on the power play after 20 minutes. The Kings would take their first lead of the night with a goal from Oscar Fantenberg at 3:42 of the middle frame. But this time, the Capitals would return the favor and tie the game with a goal from Evgeny Kuznetsov at 6:39 of the second period. Tom Wilson (12) was credited with the lone assist. The Capitals would re-take the lead with a backhanded lifter from Christian Djoos at 10:31 of the second period, making it 4-3. Alex Ovechkin (25) and Evgeny Kuznetsov (39) were credited with the assists. The Capitals would score their third unanswered goal when Jakub Vrana found the back of the net at 1`3:09 of the middle frame. Michal Kempny (13) and T.J. Oshie (17) had the helpers. The second period would end with the Caps leading 5-3. Shot attempts were 21-21 for the second period. Shots on goal were 10-10. Both Teams were 1 for 3 on the power play after two periods of play. The Kings would reduce the Capitals lead to a single goal with a tally from Austin Wagner, his second of the game, at 10:25 of the final frame. Evgeny Kuznetsov would answer with his second goal of the game at 15:13 of the final frame, to make it 6-4. Alex Ovechkin (26) was credited with the lone assist. That would be the final. Alex Ovechkin scored his NHL-leading 38th goal to give the Caps a 1-0 lead. He’s now tied with Rod Brind’Amour for the 48th most points in NHL history (1,184 points). With another assist, Ovechkin now sits in sole possession of 48th in NHL history in points. T.J. Oshie recorded his second assist of the game on Vrana’s goal. He’s now three points shy of 500 career points (203g, 294a). Christian Djoos’ first goal in 62 games dating to Dec. 30, 2017. This entry was posted in News and tagged Alex Ovechkin, Brett Connolly, Christian Djoos, Evgeny Kuznetsov, Jakub Vrana, Jon Sorensen, Los Angeles Kings, Washington Capitals. Bookmark the permalink. Changes to the lineup continue to happen and they appear to work sporadically. Seems as though the scoring has picked up from top to bottom throughout the lineup. Defensively for whatever reason goals are being scored at an alarming rate against the Capitals defense. Now it’s onto a six game road trip where this should give us a better idea where in the standings they will ultimately wind up in the Metro Division. Trade deadline is fast approaching and if the GM can make an impact deal to improve team play let’s have him make the right deal to make sure this team can go far into the playoffs and possibly win another cup.